We are busy harvesting winter greens, sowing seeds for spring, and making plans for summer. The mild winter has worked in our favor, we have already donated 20 pounds of greens and herbs to Esther's Pantry this year! Radicchio, fennel, and spigarello harvested from the Campbell Community Garden in late February. FYI: Garden plots are all full for the year, anyone who registers now will be placed on the waiting list. When can we plant tomatoes? Will it ever warm up? It is still too cool to plant tomatoes and other warm weather crops outdoors, tomatoes need night time temperatures that are consistently over 50° and soil temperatures over 60° Peppers would like it even warmer! Until it warms up I recommend moving tomatoes from 4" pots into a gallon sized pots, then to a 2 gallon pot. Setting them in the sun each day (or sheltering them from rain and hail) and moving them inside at night. Once the weather has warmed, dig a deep hole, remove the lower branches and leaves and plant the tomato deeply, allowing the stem/trunk to sprout roots. The video below was taken 4 years ago, since then I've perfected my tomato growing method, now I train them onto a trellis instead of staking them; however you choose to grow them. be sure to use a very sturdy support. Each plant is pruned to 2 to 3 main stems that are tied to the cattle panel trellis. Counting down the days to spring! It is too wet and muddy to do much gardening now, but the weather is great for planning. We plan to grow 2,000 pounds of herbs, veggies, and greens to give to Esther's Food Pantry this year, so far we have given them 19 pounds of winter squash and cabbage so only 1,981 pounds to go! How do we plan to grow that much? By planning what and when we grow it. Our goal is to have another crop ready to plant as soon as an earlier crop declines. As our overwintering kale and cabbage is harvested we are planting snap peas and after snap peas we will plant pole beans and cucumbers, then we will cover that plot with plastic covered hoops and grow lettuce, chard, and carrots over the fall and winter. This is the first year that the garden doesn't have a big project in the year's plan. We just finished hooking up our rainwater harvesting tank and our perennial herb garden was completed last fall. This years plans include building a trellis to shade our classroom/bench area, and acquire a pop-up canopy to shelter volunteers from sun and rain during volunteer and educational events. This tank will hold 275 gallons of rainwater. It will take about 8 inches of heavy rain to fill it. It isn't big enough to use for summer watering, however we have several garden plots covered with plastic or cloth in the winter and this water will really come in handy. Thanks to all of our supporters who help to make the Campbell Community Garden Great! Spring will be here before you know it. The Campbell Community Garden has plots open for the 2017 growing season! Plots are available for City of Milwaukie residents with preference given to Hector Campbell Neighbors. Currently we have 2 small plots open, $30, and one medium plot open $40 + 4 hours of volunteer time per year. Register on the "Rent a Garden" tab. If you want a bigger garden, register and you will be put onto our waiting list (we expect a few more plots to open up soon). 2016 was a great year in the garden. It was our fifth summer gardening at the Campbell Community Garden and we continued to learn more about how to best grow veggies. We have tried many varieties of plants over the seasons and have found a few that really stand out as good ones. We are very thankful to Renee’s Garden Seeds for the donation of many seed packets to our garden. Below are a few of the standouts. We have found the Raven Zucchini to be one of the best producers in our garden; it is late to get powdery mildew, doesn’t scratch the picker like many other varieties, is a compact form and tastes great. We direct sowed 3 rounds of Raven Zucchini in 2016, the first planting was under row cover in early May, it grew fast and strong. The second planting was in late June, it did not do as well as the early planting, it was stunted and never really produced, I think it failed due to too hot weather and the fact that it was shaded by the earlier plants. Our third seeding in mid-July did great, producing all the way to the fall rains in Mid-October. In 2017 we will plan better to provide full sun for all seedlings, and absolutely plant a mid-summer group for fall harvest, we may even try a fall row cover to extend the season to Thanksgiving. Another outstanding veggie is the Green Fingers Cucumber. These little cucumbers happily scrambled up a trellis and produced handfuls of cute little thin-skinned fruit all summer long and continued to produce into mid-November (in spite of have the second wettest Octobers in history!) We have grown Marketmore 76 for donation in the past, but plan to plant Green Fingers for donation in 2017; we think the small size and thin skin will be appreciated by the food pantry. Baby Honey Nut Squash! Wow it was great in our small garden plots. Our squash were about one pound each; the small size is perfect for a meal for two. And I think the small size is great for beginning vegetable eaters and for donation to the food pantry, a full size butternut squash can be intimidating, but Baby Honey Nut is cute! Peppermint Stick Chard is one of the prettiest greens in the garden. It deserves a place in the front border, an annual you can eat! We direct sowed it and also grew transplants; we found the transplants did a little better. Leaf miners were kept away with row cover early in the season and later we kept a watch for their eggs and rubbed them off as we saw them. We were able to donate many gorgeous bunches to the food pantry. We have been told that the food pantry had trouble using of the kale we have been donating and we have had trouble with white flies in the garden, so in 2017 we will focus more on growing lettuce. Garden Babies Lettuce has performed very well for us and is a good one to donate. We cut it as a full head and donate it whole. The “stump left behind makes a second set of baby Babies! The whole heads are easier to rinse and stay fresher than cut leaves. The Campbell Community Garden has a few plots open right now. Our rental season usually goes from January 1st through December 31st, but anyone who rents a garden now will get 15 months of gardening for the price of 12! The Campbell Community Garden in January, YES you can grow veggies in winter! Fall is a great tine to start gardening. There are many things one can grow over the winter in Milwaukie. 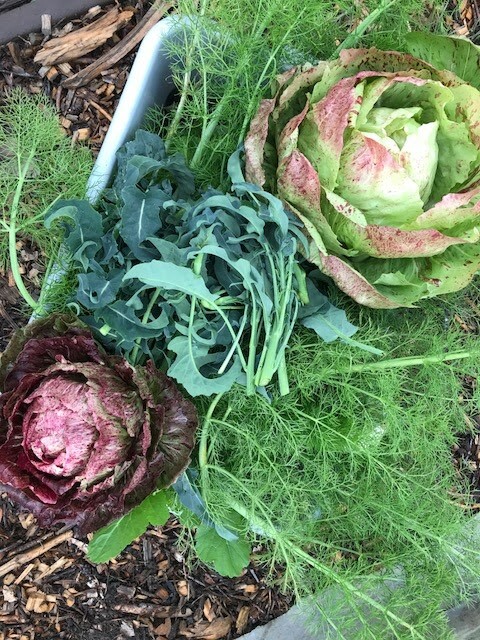 Hardy greens, root veggies, garlic, If you live in Milwaukie and want to start gardening, go to our Rent a Garden page to get signed up. Tomatoes are coming on strong now! Beans, cucumbers, and squash need to be picked nearly daily. And plans for our fall and winter gardens are being made. This week we will donate over 100 pounds of garden veggies to Esther's Pantry. Thanks to The Peck's for visiting our garden and writing this nice story about our community effort: Community gardens grow more than vegetables, fruits.